For a 1 year old dog named Little BEAUTY, the days don’t seem like they will get any easier. Little BEAUTY’s owner didn’t want her anymore, and so she gathered all of her toys, and her beloved dog bed, loaded her into a car, and mercilessly surrendered her to the Riverside County Animal Control - Coachella Shelter. 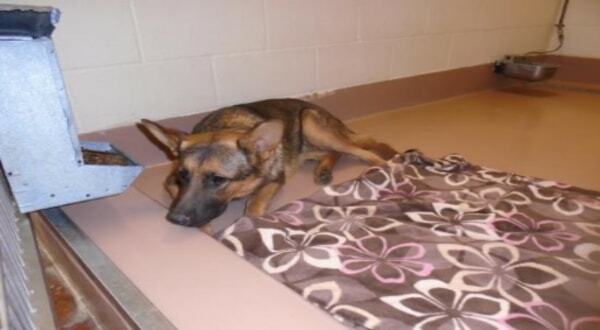 I am a female, black and tan German Shepherd Dog. The shelter staff think I am about 1 year old. I have been at the shelter since Jul 17, 2018. Oh dear....I think she is going to need a lot of help. Photo taken from a distance in kennel....hope I'm wrong. Little BEAUTY, who at her young age seems to sense that the stakes are high, can often be found tucked away shaking in her favorite blanket, cowering in fear from the noise and chaos that is the Coachella Shelter. When the lights go out, and everyone goes to sleep, soft and subtle weeping could be heard coming from her kennel space. Little BEAUTY cries herself to sleep every night wondering what on earth she did to deserve her new fate. Sad indeed. 1 Response to "Terrified shepherd puppy surrendered to kill shelter with her favorite blanket, left with no more tears to cry"